SevenRoomsAlexa is making its first foray into restaurant technology. 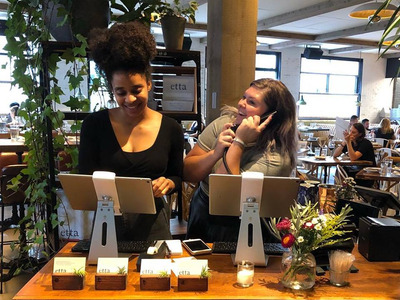 Amazon announced on Wednesday that it has invested in SevenRooms – a hospitality startup that specialises in restaurant software – via its Alexa Fund. Through its Alexa Fund, Amazon has invested in SevenRooms, a New York-based hospitality startup that specialises in restaurant software, the companies announced in a joint statement on Wednesday. Per Amazon’s rules regarding Alexa Fund investments, the amount raised was not disclosed. SevenRooms previously raised $US8 million in a Series A round led by Comcast Ventures in December 2017. But what’s more interesting is what will happen behind the scenes. SevenRooms’ technology remembers customers and their preferences. That means it will already know your favourite wine if you order it a lot, and it will remember an allergy if you’ve told staff at a SevenRooms-affiliated restaurant about it before. That information will be at the fingertips of those serving you. “There’s a perception that they will be looking down at their iPad or looking down at a profile as opposed to actually making eye contact with the guests and greeting them warmly,” Montaniel said.